We had such a long, cold, rainy stretch of spring and then last week it turned to summer overnight. I am still a bit in shock with the sudden change, but now June Is Bustin’ Out All Over and I am nearly dancing on the rooftops like the folks in Rodgers and Hammerstein’s Carousel “because it’s June! June, June, June, just because it’s June, June, JUNE!” I really look forward to the promise of June in Sweden. The weather warms up, Swedish strawberry season begins, and the smultron (wild strawberries) will be ready this month around the time we celebrate the summer solstice for Swedish Midsommar. June also means elderflowers and that has me chanting “June, June, June!” some more. Ever since June popped, I have been eyeing the elderberry bush outside our kitchen window, waiting patiently. Ok, I have actually been completely impatient and antsy to see the lacy flowers emerge, but finally they have arrived and the butter-colored blossoms are hanging heavy from the branches. Let the foraging begin. 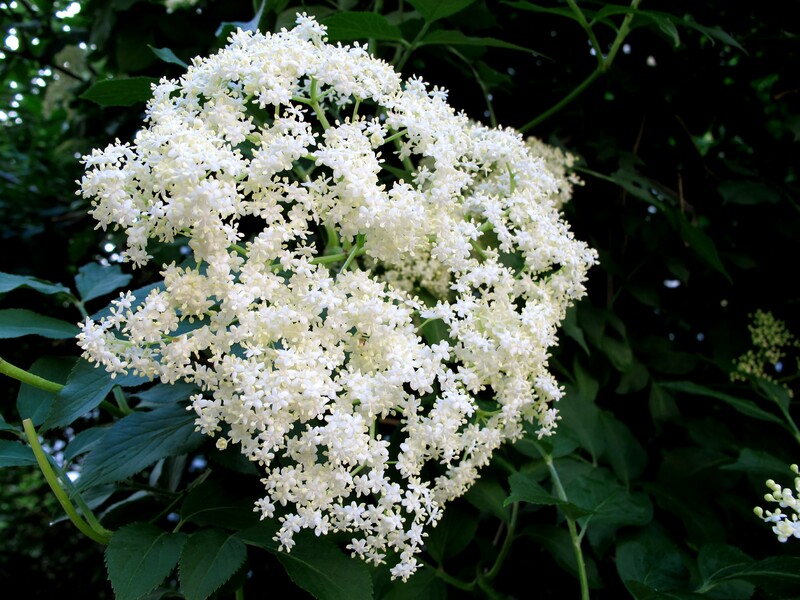 Elderflowers are typically in season during May and June. It’s best to harvest them when they are a rich, creamy color before they turn white. Ideally pick the flowers early on a dry day before the sun starts to fade their aroma. Look for flower heads with buds that are fully open, but not turning brown. Snip off the whole umbrellas and place them gently in a paper bag. The pollen contributes to the taste so transport them carefully. For maximum effect they should be used within a couple hours of picking. They don’t need to be washed but do inspect them closely and remove anything crawling or undesirable before use. 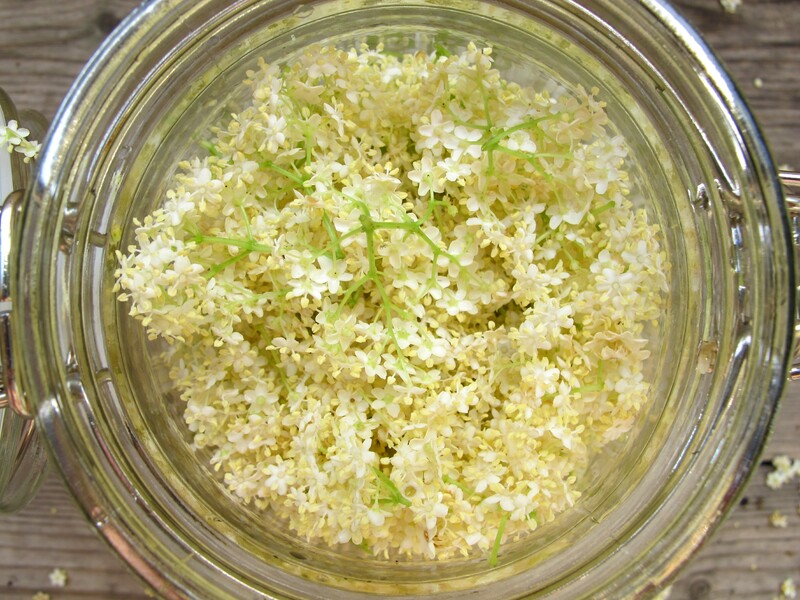 I found this elderflower liqueur recipe on Hank Shaw’s Hunter Angler Gardner Cook blog. Hank’s site is a wealth of information about what foods you can find in nature coupled with a myriad of intriguing recipes. When I found the elderflower liqueur recipe I couldn’t wait to submerge my elderflowers in a jar of vodka to see what happens. Now the waiting has begun for the finished product. But if you’re anything like me, you don’t need a final verdict to give this one a try. It’s just too seductive to pass up and I wanted to share the recipe while the elderflower season is in full swing. 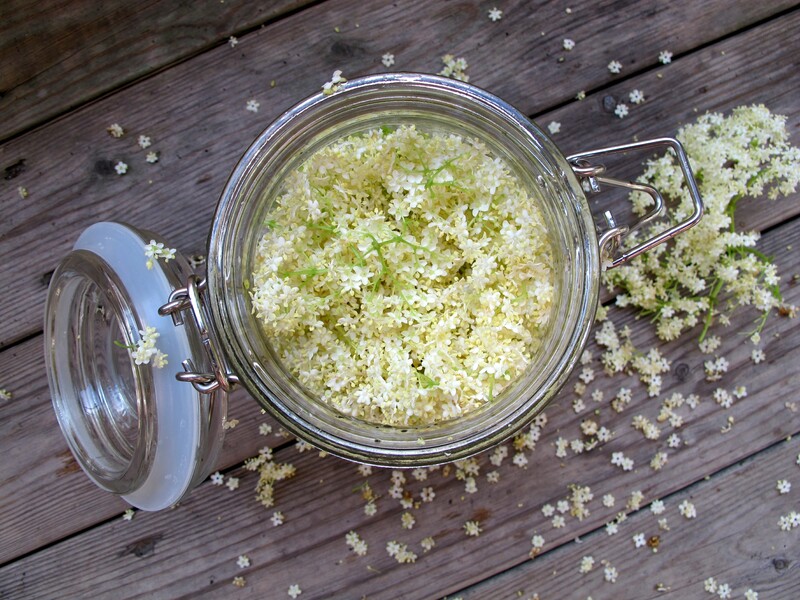 Snip the elderflowers off of the stalks into a quart (litre) jar (the stems can be toxic so leave as little stem as possible – you can use a fork to comb the flowers from the heads). Pour the vodka over the flowers and make sure they are submerged. Seal the jar and put it in a cool, dark place for one month. Over time it will start to turn a dark amber color. After one month has passed, strain the alcohol through a cheese cloth into a clean quart jar and discard the flowers and debris. Add ¼ – ½ cup sugar depending on your taste, seal, shake well, and return the jar to the cool, dark place. Shake the jar periodically. When all of the sugar has dissolved it is ready to drink. I imagine that is like our Western US elderberry, genus Sambucus. There are a number of species and varieties. Do you happen to know yours? Some of our collecting sites could be pretty dangerous now due to proximity of the Logan River. I’m certainly no expert, so I’ll refer you to this site http://elderberries.ning.com/forum/topics/elderberry-faq-what-they-are . It seems likely that I am foraging from the European Elder, or Sambucus nigra (also called Black Elder or Common Elder). But in your area, you could possibly have access to the same type, or the American Elder Sambucus canadensis (also called Sweet Elder). What is growing here doesn’t have any real connection to water. I remember foraging elderberries up in the mountains in Utah, and I don’t think it was near water. You need to get Mark to take you on a four-wheeler foraging expedition. I bet he knows where to go. But I’m guessing with as much snow as you have had this year your elderflowers will likely be late. 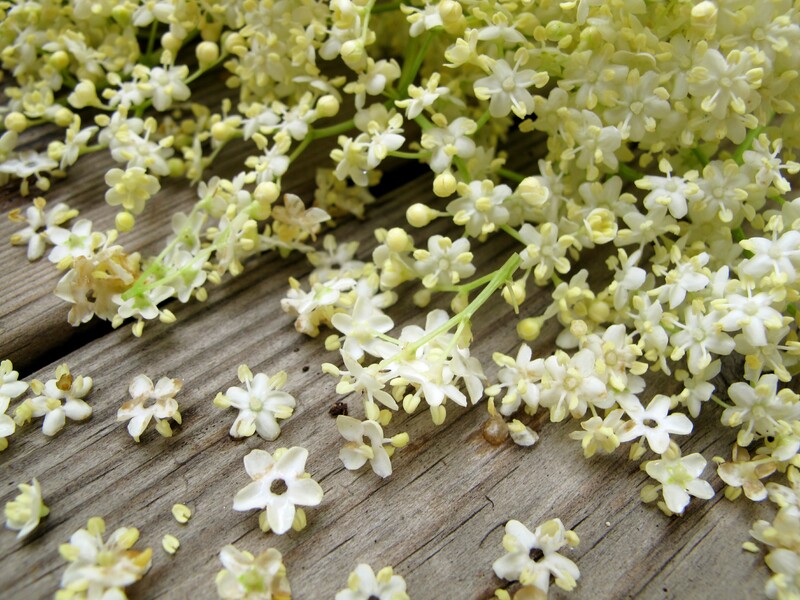 Oh great info and pics of Elderflowers!